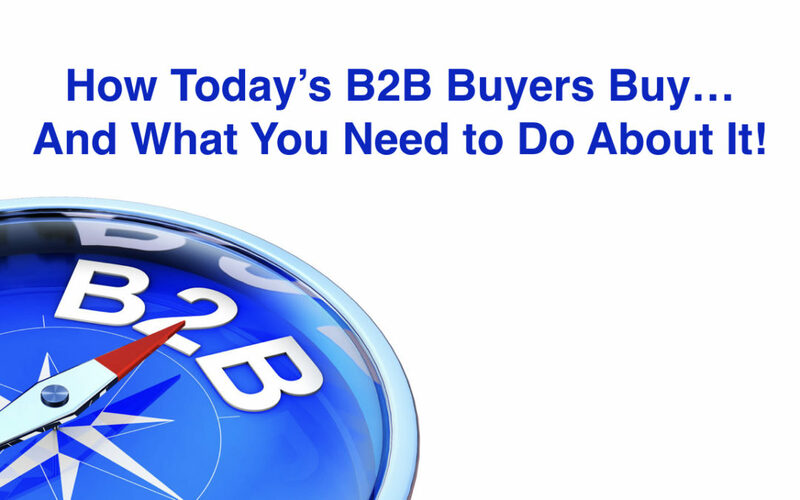 How Today’s B2B Buyers Buy…And What You Need to Do About It! In the past B2B buyers certainly understood their business, but they generally did not know how our solutions could help. The net was that traditional Solution Selling was born, where we found a buyer’s pain and turned it into the vision of a solution. Although that continues to work quite well today with a fairly large population of buyers, there has emerged another type of B2B buyer. Depending on the study you read, approximately 55% of the B2B buyers out there could be in this newer population. They use the internet and social media to go through most of their buying decision making process without a sales person! Also, as a result these buyers want to deal with sales people who they view as thought leaders AND who can add value by propelling them beyond their current vision. Provided below is the model on how these people buy. Note that the Y-axis defines the Buyer’s level of concern, while the X-axis represents time. The time period depicted represents the duration of the buy cycle. Also note that buyers buy in 5 stages. In stage 1, although the buyers recognize they have an issue, at that point in time they don’t work to resolve it. There are a number of reasons why this occurs, but that’s the subject of another post. In stage 2, the buyers analyze their problem and develop a solution. Then, in stage 3, the buyers determine the return they can expect if they proceed, and likely develop an implementation plan. The final major item for stage 3 is for the buyer to have providers prove their capabilities. In the past this, by the way, had occurred much earlier in the sales cycle. But with this population of buyers they tend to wait until the end of the stage, when they are ready to deal with sales people. Stage 4 is dominated by risk. If they buyer is confident that they have found a provider that will fulfill their vision and do it at their desired ROI, then they will go forward. Finally, in stage 5 the buyers’ attentions turn to implementation. So in the past buyers needed sellers to help them better understand the pain they were experiencing, along with the solution they would need to solve it. Then the seller proved they could deliver and then participated in creating the ROI. But because today’s buyers have tons of information readily available to them, many educate themselves to the point of completing the buy/sales cycle through stage 3 without needing to speak to a seller! In summary, we now have two populations of B2B buyers that our sales people need to deal with, which in turn dictates the relationship buyers seek with sellers. We have buyers who look for sales people to help them create the vision of a solution to a problem. And we have buyers who are beyond that and look for visionary sales people to be able to help them boldly take their businesses beyond their current thinking and vision. Because buyers are looking for sellers who are thought leaders who can add value then we have to help our sales people become what we call Visionary Sellers. And you do not have to be born that way. You can become a visionary seller. To do that you need to do two things. 6. Propose the next steps to move the opportunity forward. Again, this tool helps the visionary seller guide the discussion with the buyer. For your hunter salespeople, it’s a proven way to open new doors. And, if you have salespeople are responsible for account penetration, they’ll find that it’s a great way for them to significantly expand their presence across their accounts. 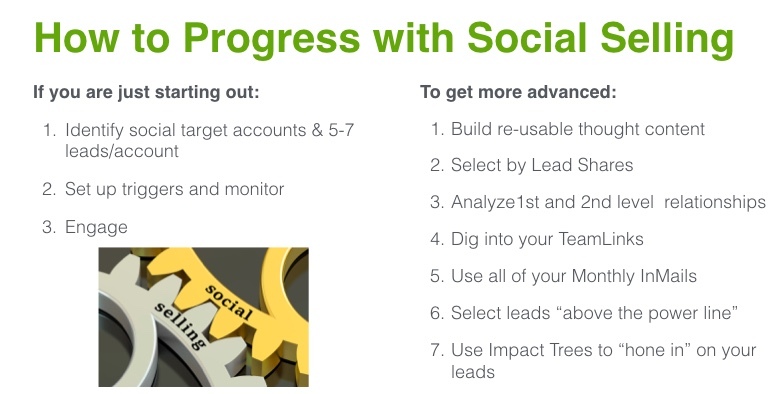 • IBM increased their sales by 400% due to their inbound social selling program (IBM). So if you’re not doing it, you should be! Hubspot defines social selling as using social media to interact with your prospects and customers by providing value through offering thoughtful content & thoughtful answers to their questions. I love the thoughtful content idea. That is what will position you with both targeted buyers who do not know you and targeted buyers who do know you as a thought leader. As depicted below, we’ve found that there’s a 3-step process to follow to get launched, along with 7 more advanced techniques you can then begin to follow.